Since returning from the Hunter Valley, Trevor has been successful in numerous wine shows, most notably the 1993 Barossa Valley Wine Show, where he was awarded three trophies, among which was the highly coveted Most Outstanding Barossa / Eden Valley Dry Red for his 1990 Cabernet Merlot. In 1994 he was equally successful, being awarded the trophy for Best Wine Small Producer (crushing less than 500 tonnes of grapes) for his 1994 Chardonnay. 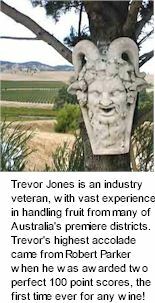 Some of Trevor's most notable accolades have come from Robert Parker, who awarded Jones two perfect 100 point scores (the first time ever assigned by The Wine Advocate) for the Old Barossa Tokay and the Barossa Liqueur Shiraz Tawny. These awards were recently followed by Best Boutique Riesling for the 1998 Eden Valley Riesling, awarded by Boutique Wines of Australia 2000. Well done Trevor!